Posted on November 22, 2017 at 5:52 am. There are four general categories for tiles, as well as some variation and subcategories. Porcelain is denser than ceramic and less porous, making the ideal for rooms and other areas that get humid or wet. There are few bathrooms and kitchens without tiles, and porcelain tiles often appear on terraces and other areas. Porcelain is made of very fine material with high silica content. The porcelain tile is manufactured with high temperatures and high pressure. This makes the end product very resistant to moisture and staining. Water absorption rate is less than 0.5%. Of course porcelain is the first choice for wet areas, but they also work well in other areas of the home. They are durable enough to withstand from light traffic to heavy traffic and look good with many different decors. These are usually popular for wall applications. They are cheaper and easier to install than porcelain, and quite easy to clean and maintain. They are popular with DIYers who want stylish results with minimal difficulty. Manufactured with less heat and pressure the ceramic tiles are finished with a durable glaze that provides the colour, pattern and water resistance. 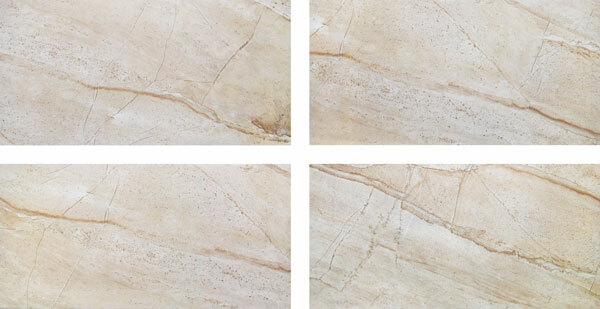 Stone tiles can be marble, limestone, travertine, granite, sandstone, or sometime other natural rock materials. The properties of these vary, but that are all natural (rather than synthetic) materials and most will usually require sealing. These are used for mosaics and patterns made from different tiles. Modern manufacturing techniques and large production runs allows good quality tiles to be produce quite economically.